Amazon is back with its new quiz to promote Samsung Galaxy A8+. 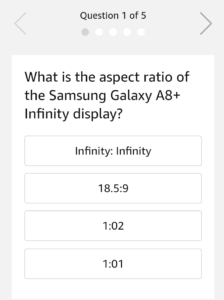 Amazon is asking 5 questions, and we added Amazon Samsung Galaxy A8+ Quiz Answers. So, that you can easily answer and win Samsung A8+ Quiz. So Answer the Amazon A8+ Quiz questions and test your luck. Start answering now !! 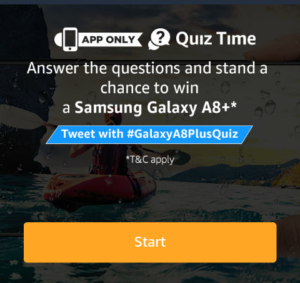 1 How to Answer & win Amazon Samsung Galaxy A8+ Quiz? 1.1.1 Q1) Which of these is NOT a features of the Samsung Galaxy A8+? 1.1.3 Q2) What is Samsung’s virtual assistant called? 1.1.5 Q3) What is the display on the Samsung Galaxy A8+ called? 1.1.7 Q4) What safety features does the A8+ come loaded with? 1.1.9 Q5) The A8+ has __GB of RAM. Fill in the blanks. How to Answer & win Amazon Samsung Galaxy A8+ Quiz? 2. 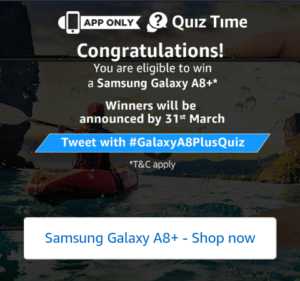 Open the app and you will see a banner about the Samsung Galaxy A8+ Quiz Time contest. Click on it. Q1) Which of these is NOT a features of the Samsung Galaxy A8+? Q2) What is Samsung’s virtual assistant called? Q3) What is the display on the Samsung Galaxy A8+ called? Q4) What safety features does the A8+ come loaded with? Q5) The A8+ has __GB of RAM. Fill in the blanks. 5 . Done !! You’ve answered them all correctly. A total of 6 (Six) participants will be selected as winners of the Contest who answer all questions correctly. The declared winner(s) will be eligible for winning a Samsung Galaxy A8 Plus device as a prize.